Clearly, we know what I'll be watching this weekend. still even more obscure Good Morning, Miss Bliss, the precursor to Saved by the Bell. Hardly! Last I checked, they still syndicated that on TBS in the mornings! And whenever I'm home at the time and they're showing it, I'm always pissed about it because while I've seen it more times than I care to mention, no one is ever in the mood for pre-SBTB! Still, I suppose it's better than seeing The College Years. Love love love this movie. Sigh. It was Haley Mills's first kiss, you know. Lucky girl. And, oh, the quotes! "Quick, like a mouse!" "Madame HaBIB!" "I feel all sort of loft and softy..."
If I could find mine in my two boxes of DVDs right now I would. Hahaha. Yay, cc! What kills me is that it's *all* on YouTube. Then, when you're done with M-S, try Summer Magic, because it's SO fantastically sexist, you wouldn't believe. Plus, with cheesy songs! Love. It! Hahah, I didn't know Miss Bliss was still on. Those were good quotes, jen...loft and softy. HAH! You and Kev are scary. When he mentioned MoonSpinners last night I had to think hard to remember it, then look it up to remind me of the plot. Spooky. I totally just Paperbackswapped that Moon-Spinners book. I didn't know until last night that it *was* a novel. Which is awesome. Awe. Some. I love Summer Magic - "Ugly Bug Ball" rules! Guess I will have to check this one out, too. 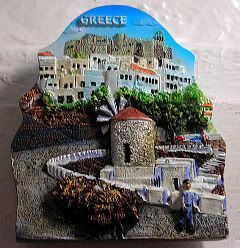 Is there a shop in Tarpon Springs that sells magnets from all over the world? Or are they connected to Greece somehow? I must know - it might even be worth a trip! Hee - pink of perfection is my fave. Or the other one about the land of milk and honey. Heh. But Tarpon Springs has a really big Greek community, because of the sponge industry there that was spearheaded (hee) by some Greek guy back in the day. And for some reason they had actual Greek magnets in the store. Heh. I remember now...that's the movie you made me watch at your parents. Didn't I end up falling asleep on the couch? Probably. But it was still a supertotallyfabulous movie anyway. I love the "Beautiful Beulah" ragtime song in "Summer Magic." yeah. I think I have tomorrow's magnet now. Heh. the BEST part of moonspinners is when nikky is stealing the alcohol for mark camford's wound and the old lady sees the bottle moving across the bar and stops clapping a second.